BE-AT.TV, the world’s largest dance music media platform, today continued its spread from Ibiza to the world through a new distribution deal with Music Choice. 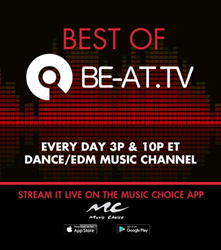 BE-AT.TV will take over two blocks of programming on the popular Music Choice Dance/EDM Music Channel (3-5pm ET and 10pm-12am ET) seven days a week featuring mixes from Ibiza Sonica and tracks from Trackitdown that showcase a more refined side of dance music. Music Choice and BE-AT.TV’s co-branded facts and photos will appear on screen to complement the music experience for listeners. BE-AT.TV founder and CEO Ray Smith made the announcement.